This blog has moved to indicatrix.org. For those with feed readers, the feed is now here. I presented a poster (above) at the California Geographical Society, hosted by UC Davis, this weekend demonstrating some of the analytics possible with OpenTripPlanner Analyst. 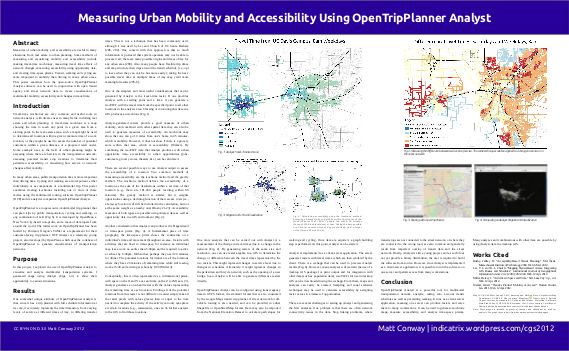 The full poster and maps are available here. I’ve been working on the OpenTripPlanner project quite a bit lately. One thing I did a month or so ago was to implement elevator support in the routing engine. I decomposed OSM nodes tagged highway=elevator by their constituent levels, and built edges between them to represent boarding, riding on, and alighting from an elevator. I was very impressed with the friendliness and responsiveness of the community. Use an OSM Level Map relation if there is any possibility that level names would not be clear. EDIT: To clarify, the level annotations are always on the ways connecting to the elevators, not the elevator nodes themselves. BART shocked Bay Area transit enthusiasts this morning with an announcement that it plans to build a new infill station, to serve all San Francisco lines, at Treasure Island. Cyclists, however, are happy about the project. The new eastern span of the Bay Bridge will sport a bike path, but the western span, not scheduled for replacement, does not. By allowing a quick connection between the Yerba Buena Island and San Francisco, a cyclist can ride to Yerba Buena, then catch BART for a quick ride into the city. Responding to the head of the Greater Golden Gate, Gough and Geary Boulevard Cyclists’ Association, a BART employee confirmed that the cycle link is a critical part of the project, and that the station will have new electronic bike lockers, as well as easy bicycle access from the bridge. For anyone who hasn’t caught it yet, note date of issue. And if you still haven’t caught it, read this article. # Subtract 32768 if either one was NoData, giving us -32768 for NoData. Of course, you can’t actually put the comments in. But what it does is this: First, I subtract one raster from the other and multiply that by the logical operation that neither one contains NoData. That gives me the difference of the rasters, or 0 if either one contains NoData. Then I subtract 32768 multiplied by the inverse of the aforementioned logical operation, so any pixel with a NoData value in either of the original rasters is -32768 in the new one. Note: I expanded on an idea from the GDAL gdal_calc.py script. For now, anyhow, you’ll need to be running the dev build of QGIS. Happy GISing! Change the ServerUrl to your Tiled Map Service server (this one is for MapQuest Open Tiles), then go into QGIS, Layer->Add Raster Layer and select the XML file. The OpenLayers plugin automatically adds the required attributions, at least for OSM. This can be nice or not—nice in that you don’t have to remember to add the attribution, not so nice in that you can’t choose where to place the attribution; it’s always in the lower-right. Reprojecting layers with text may yield strange skewing and distortion. You need to be sure that you use these services legally (as you did with OpenLayers plugin). You can also convert tiles to GeoTIFF using gdal_translate, but I suspect most TMS providers would prefer you didn’t. This blog has moved to indicatrix.org.